Hello! I could go on about how I've been sick the past few days but I won't, just need to get bed early for a few nights and hopefully I'll shake this cold! 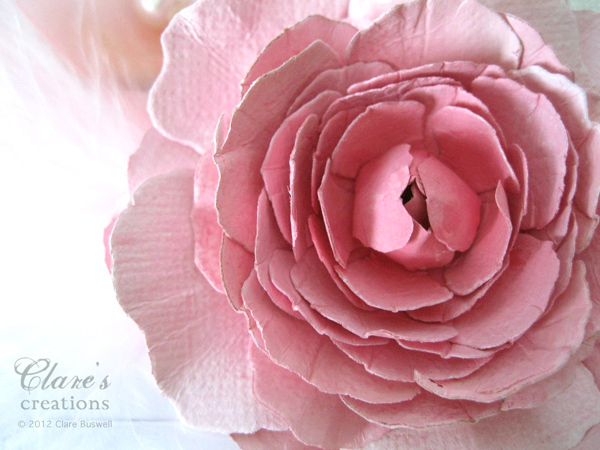 Needless to say the past couple of days haven't been that productive, I did however manage to try out that cabbage rose tutorial I stumbled upon a few weeks ago. 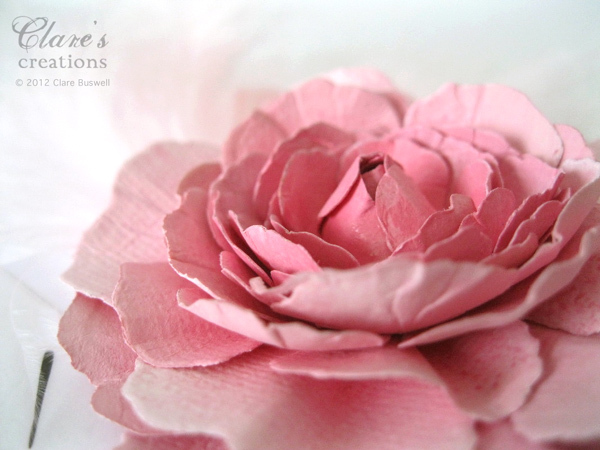 The Spellbinders Rose Creations dies have been sitting on my desk that whole time! Anyway, it's our second week at CASE Study with Karola Witczak as our fabulous muse, here's her wonderful card this week. 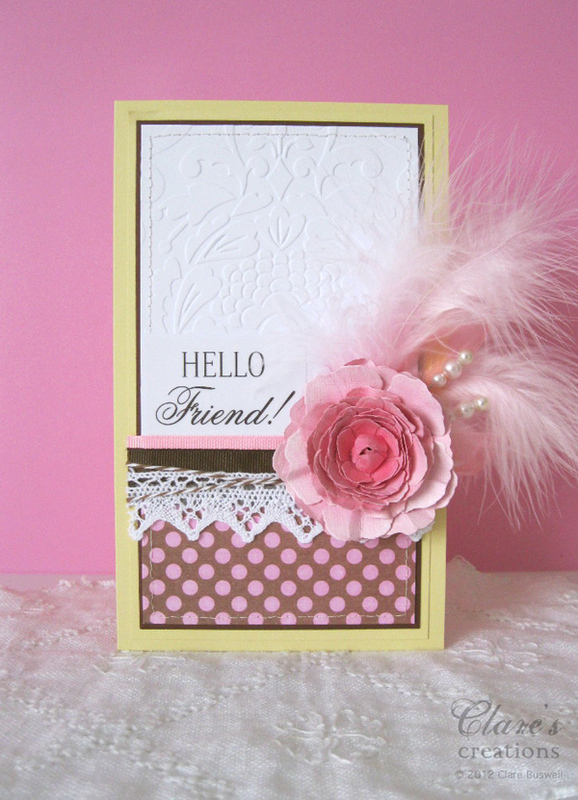 I did have fun with this card, using the trigger as color inspiration as well as the whole fancy schmancy theme I decided to use some feathers on my card, feathers do make things pretty fancy! 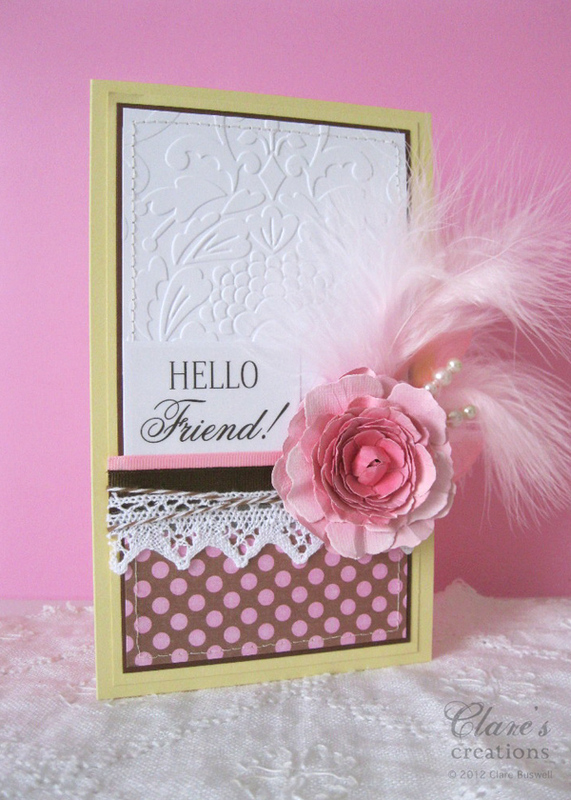 They add a lovely softness and delicacy to a card too! 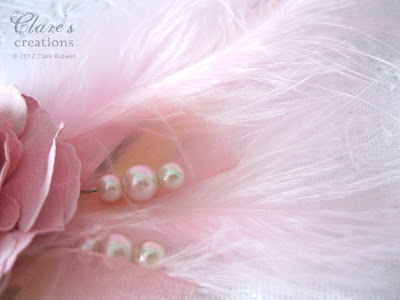 These lovely soft Pale Pink Marabou Feathers are from the Craft Fairy, they have some other gorgeous colors too that I'm dying to play with! The Sweet Pink Trinket pins are from my Etsy shop. This was my first attempt at the Cabbage Rose, I'm quite happy with it, I'd like to try a few more though. I pretty much followed the tutorial, I used a pale pink light cardstock but I added some shading with a sponge to each layer (before assembly). I made the outer tips lighter with white acrylic paint and the centers darker with a pink acrylic paint. I like the effect it gives. 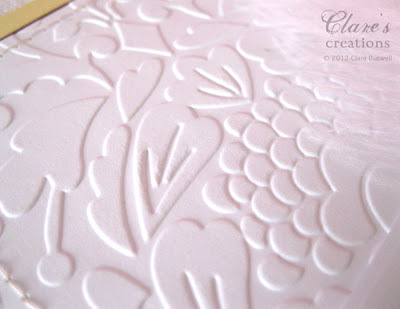 The top half of my card I embossed using the Sizzix Flowertopia embossing folder, love this one, so pretty. Here's a close up of the detail. 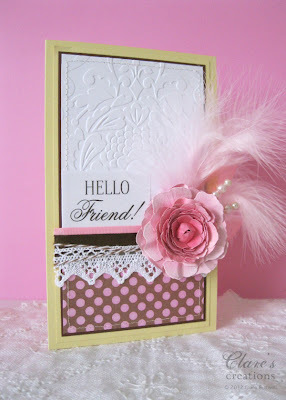 The brown and pink dotty paper is from Sweet Nectar by K&Co. 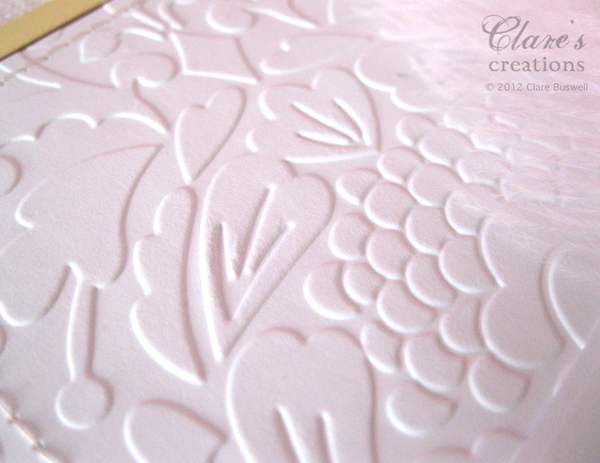 Of course I had to use some Fancy Sentiment Stickers for my fancy card! 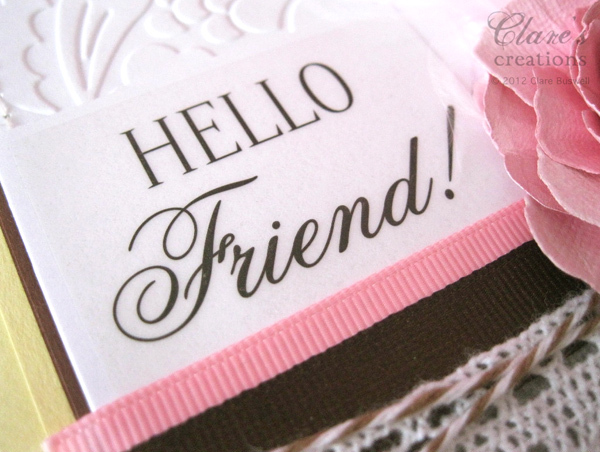 : ) So I used the 'Hello Friend!' sticker from Fancy Sentiments - Thinking of You by SRM Stickers. The Pink Grosgrain Ribbon and Dusty Rose Organza/Chiffon Ribbon are also from the Craft Fairy. OTHER: PALE PINK MARABOU FEATHERS, ROSE PINK CHIFFON RIBBON, PINK GROSGRAIN ALL FROM THE CRAFT FAIRY, SIZZIX FLOWERTOPIA EMBOSSING FOLDER, SPELLBINDERS ROSE CREATIONS DIES, WHITE CROCHET LACE, BROWN GROSGRAIN, BROWN.WHITE BAKER'S TWINE, SWEET PINK PEARL TRINKET PINS, SEWING MACHINE, DIE CUTTING MACHINE (BIG SHOT), PINK AND WHITE ACRYLIC PAINT. 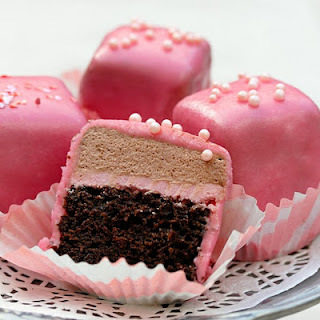 Claire, what a pleasant evening spent reviewing your blog and seeing your lovely, whimsical, happy creations. Are you a gardener, too? If so, your artistic talents must spill from the garden to your paper, and vice versa. I never thought of including feathers in the floral arrangements, yet indoors, my arrangements all contain peacock feathers or other feathers found in our acreage. Thanks for inspiring me tonight. Stunning! Your cabbage rose is incredibly life-like, and I love the addition of the feathers! I love this card Clare. The rose and feathers are just fab. Thanks for the link to the tutorial. Hope you soon feel better. 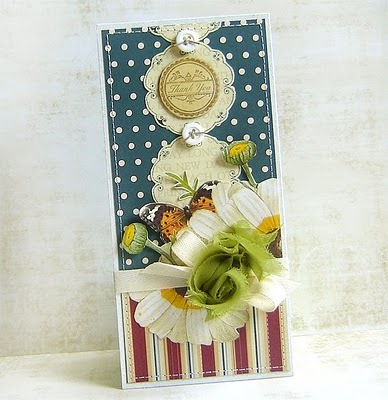 Beautiful card ... your flowers are amazing!